Need help? It’s easy! You simply pick one of three approaches for solving quadratic equations – factoring, completing the square, or by quadratic formula – and execute. For this lesson, let’s solve by factoring. First, factor the quadratic equation. Then, find two numbers which add up to 7 and multiply to give 6. Now, find the value x so that when these brackets are multiplied together the answer is 0. Got it? Great! You should have found that x can equal 1 or 6. If you’re anything like me (NOT a math expert), you might be feeling completely lost right now. In fact, the above paragraph could almost read similar to a foreign language. Now, imagine if you weren’t in school on the day factorising was taught. How would you do on a test? Instead, imagine that you HAD attended school that day. You were able to participate in a classroom lesson led by a teacher who had demonstrated how to do each of these steps. You (and your classmates) were able to ask questions, receive feedback on your work, solve problems together and learn in the classroom environment. Suddenly, factorising isn’t such a daunting approach. In fact, you’re becoming quite the pro! Go math literacy! Go you! When students miss school (for unexcused or excused absences) they miss out on critical instruction time that supports success in school and in life. Children who are chronically absent, defined as missing 10 percent or more days of the school year, are much more likely to struggle academically. These struggles can affect grade-level literacy by third grade, a critical time when students transition from learning to read to reading to learn. Chronic absenteeism creates and widens achievement gaps through elementary, middle and high school. Chronic absenteeism doesn’t just affect the single student – it affects the entire classroom. In a recent study, classrooms in which half of the students were chronically absent had test scores that were 10 percent lower on average than those in classrooms with no chronically absent students. In our region, 7.1 percent of all elementary students missed more than 10 percent of school days in 2015-16. That’s 6,058 chronically absent students. Students from low-income families are more likely to be chronically absent. The impact of absenteeism on their academic performance is twice as great as it is on their affluent peers. 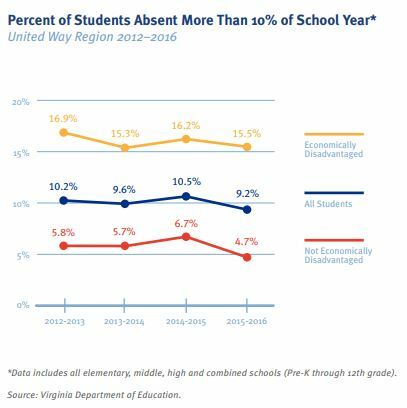 In our region, 15.5 percent of economically disadvantaged students (grades pre-K through 12) were chronically absent in the 2015-16 schools year, compared to just 4.7 percent of non-economically disadvantaged students. Interested in seeing more data? Check out our 2017-18 Indicators of Community Strength. What is United Way Doing? Addressing chronic absenteeism isn’t as simple as, “get students to stop skipping school.” Chronic absence includes all missed days – excused or unexcused – and emphasizes the critical need for students to participate in much needed instructional time in order to succeed in school – and life! In Petersburg, 14.4 percent of all elementary school students were chronically absent in 2015-16, the highest percentage in our region. And it is no single person or organization’s fault. Regular school attendance depends on factors such as stable housing, access to health and well-being services, school climate and all of the basic needs that humans need to thrive. Recognizing this, United Way of Greater Richmond & Petersburg serves as the backbone of the Petersburg City and Schools Partnership. Working closely with Petersburg City Public Schools’ superintendent and the City of Petersburg’s city manager, this collaboration between state and local government agencies, service providers and community groups including nonprofits and religious agencies is working to break down the barriers that stand in the way of student attendance. Together with its partners, United Way wants to establish the climate and conditions for every child to succeed by providing a sustainable, coordinated system of supports and access. How do we do that? The City and Schools Partnership has six workgroups (Community Education and Advocacy, Housing, Nutrition, Out of School Time, School Climate and Student Health & Well-Being) that are working to address the barriers that keep students from getting to, and staying in, school. These work groups are aligning individual and organizational actions to establish shared goals that combat the barriers blocking the way to student attendance. One example? The Student Health and Well-Being Work Group is leading an initiative to create a school-based health center in Petersburg City Public Schools. By providing access to care in the location where students spend most of their time (school), the work group aims to create the conditions for students to thrive in school and in life. What’s next? To further stress the importance of attendance, we are launching an Attendance Awareness Campaign with Petersburg City Public Schools. Through this initiative, we plan to spread the message of the importance of attendance with our entire community while continuing to address the underlying issues that impact student attendance. With key messages driven by student voice and carried throughout the community by leaders in all sectors, there will be a resounding cheer that in Petersburg, and in our region, attendance matters! Become an advocate for attendance. Share information about the importance of attendance and make sure all of your friends and colleagues have the same understanding as you. Looking for key messages to share? Check out our page on education and attendance and the Attendance Works page on messaging. Donate to United Way to support our work in this area. Click here to make a donation. Join us! Attend the next Petersburg City and Schools Partnership meeting. Serve on a work group. Or contact us to become a volunteer that supports student attendance in our region! Visit our Volunteer and Events page to learn about upcoming opportunities, or email volunteer@yourunitedway.org to ask about other ways you can get involved. Audrey Trussell works for United Way of Greater Richmond & Petersburg as the Vice President of Community Impact. Email Audrey at trussella@yourunitedway.org.